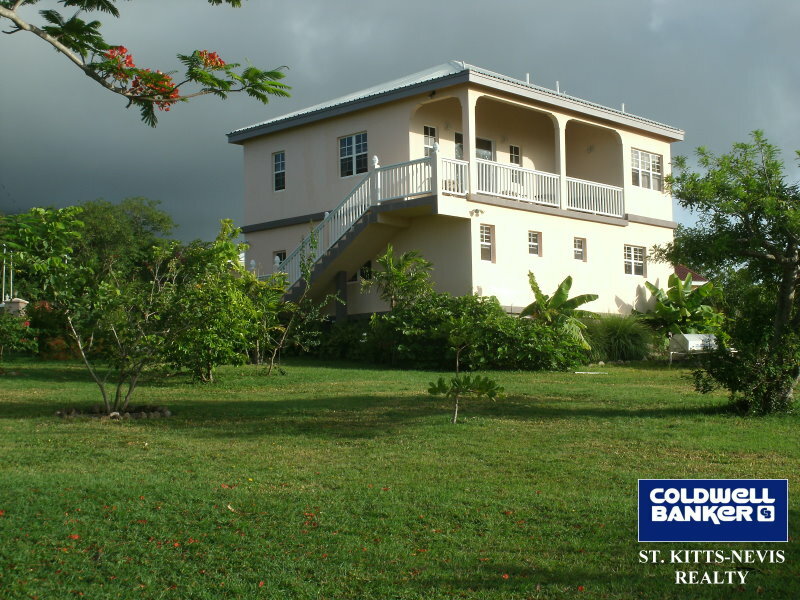 Round Hill Villa is a very nice comfortable home of some 2000 ft² located at the end of a private cul-de-sac, off Shaws Road in St James's parish. 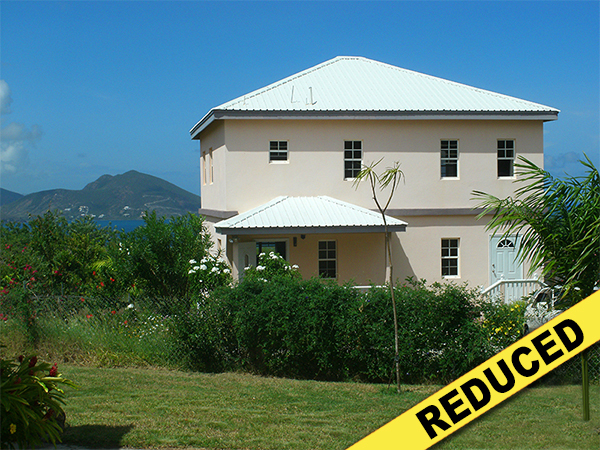 This villa is within a short walk of the Mount Nevis Hotel and Ocean View guest house and restaurant. There is also a three hole golf course very close by. The beach, with good snorkeling and fishing, is less than five minutes drive away. The Lot size is 18,000 ft² with a mature lawn and garden. 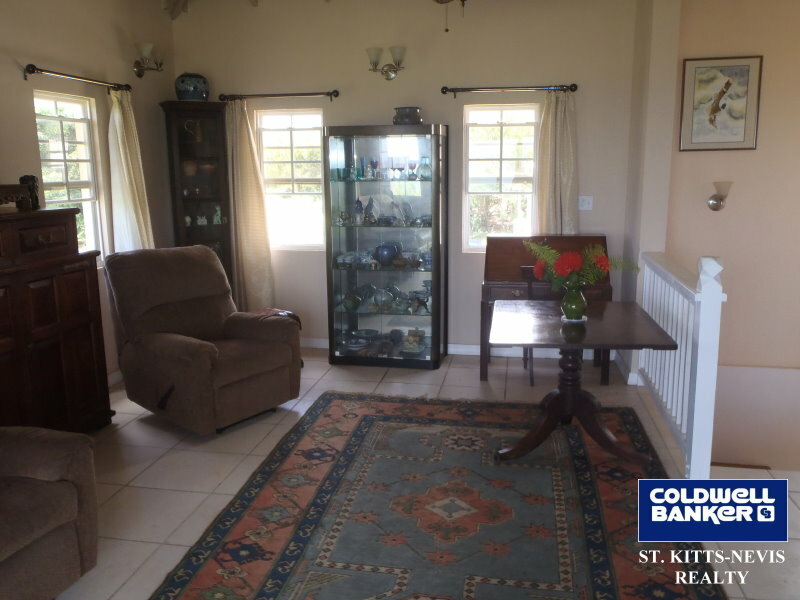 The property is fully fenced with an iron gate. 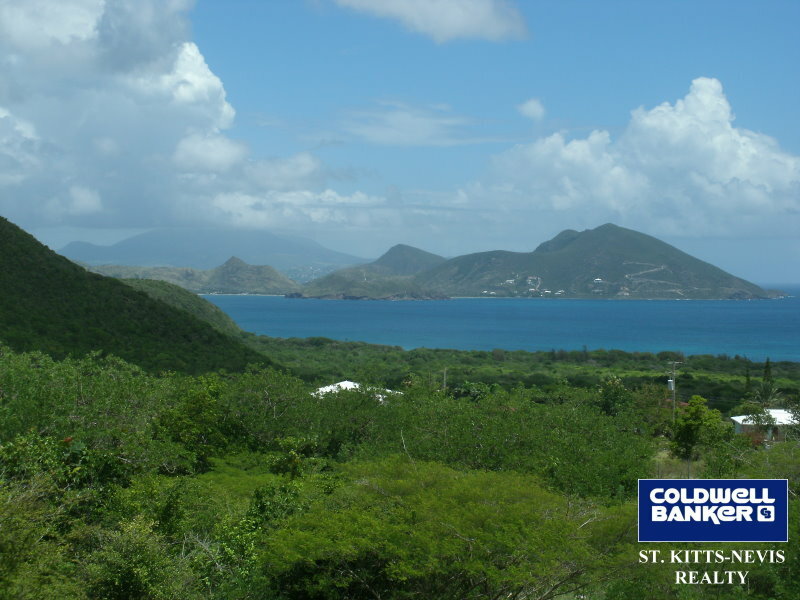 At an elevation of 300 ft., Round Hill Villa is amazingly cool at all times of the year and enjoys expansive ocean views of St Kitts and the Atlantic from almost every room. The large airy sitting room is on the upper floor to take full advantage of the cooling breezes and the stunning panoramic views. This room leads on through sliding doors to the wide balcony patio from which the views are absolutely breath-taking. A tiled outside stairway offers access down to the garden. 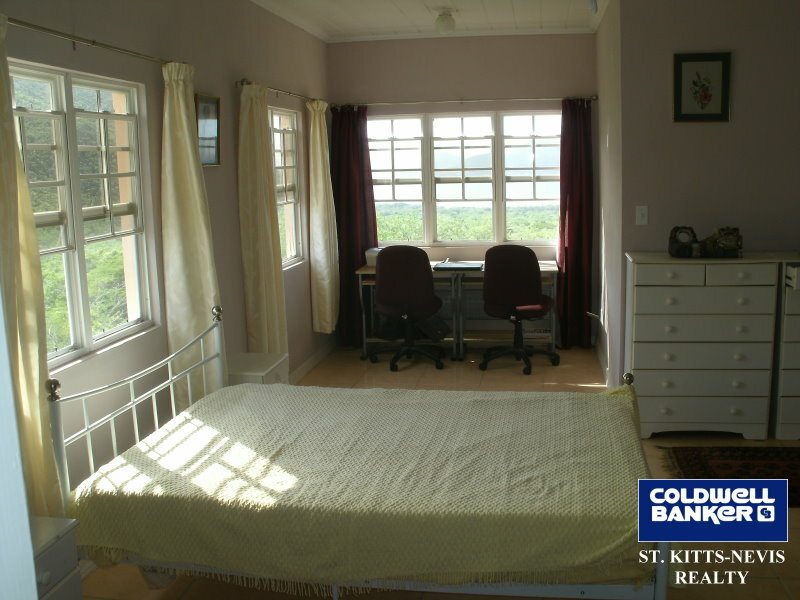 The very spacious Master bedroom (with ensuite bathroom) is also on the upper floor and has magnificent views of the St Kitts peninsula and the surrounding hills. The cool and shady second double bedroom (also with ensuite bathroom) is on the ground floor but thanks to the slope of the land the floor is some four or five feet above the actual level of the ground. 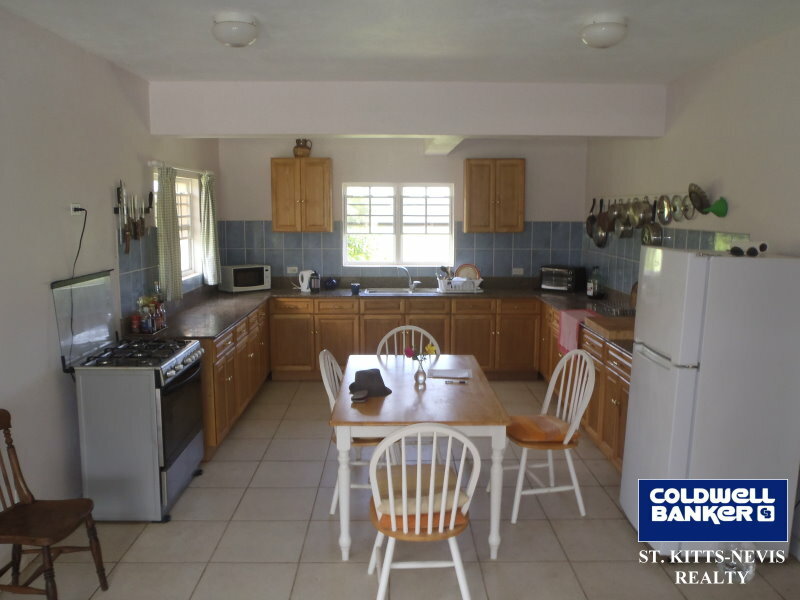 The Ground floor also houses the huge Kitchen with granite counter surfaces and extensive oak cabinets. 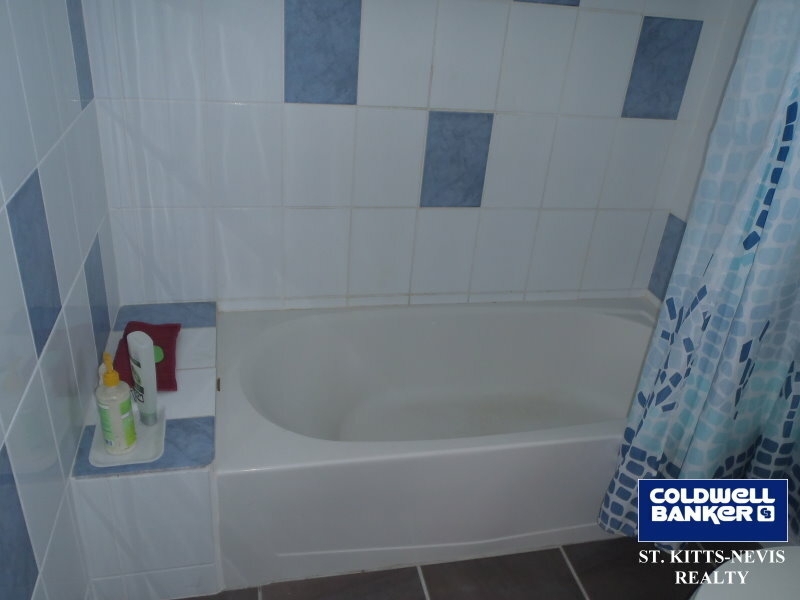 There is also a large Laundry room, and a powder room. A good-sized front porch protects the front door which leads directly into the kitchen. The garage is made of block and plaster the same as the house and has a useful attached office with work station, power points etc. There is a paved parking area with plenty of room for several cars. The solar heating system is at ground level to make maintenance easier. The generous tank provides plenty of hot water. The large garden has many flowers and shrubs as well as palm trees and fruit trees, including five mature mango trees. The garden attracts plenty of interesting wildlife such as hummingbirds, fireflies and myriads of butterflies.